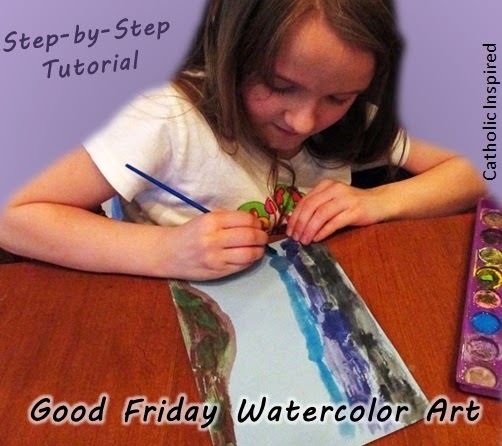 Today I want to share a watercolor art project tutorial, which I used to teach my kids. Okay, I have to admit that my kids complained when I said the word, "watercolor". But in the end they said they had a lot of fun and were VERY happy with how the paintings turned out! Since it's Lent, I wanted to create something that was focused on the season. 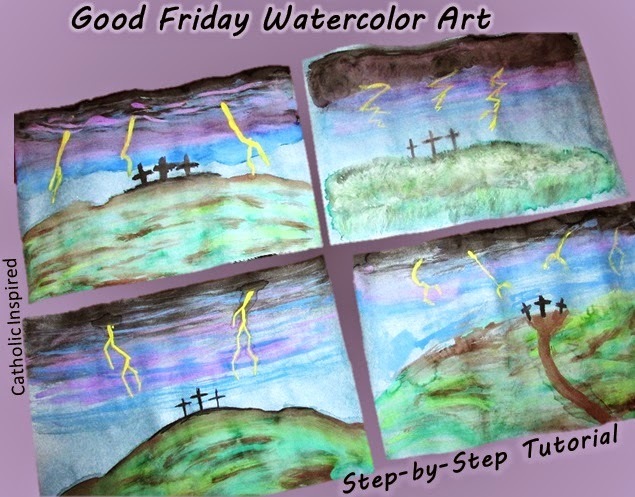 A Good Friday project just seemed to be perfect! Note: half sheets are easier and less intimidating for kids to work with. Note: light blue paper is easier for kids who are just starting to learn this skill. This way they don't feel the need to fill the paper. The more water you add, the softer the color. The less water you add, the darker the color. 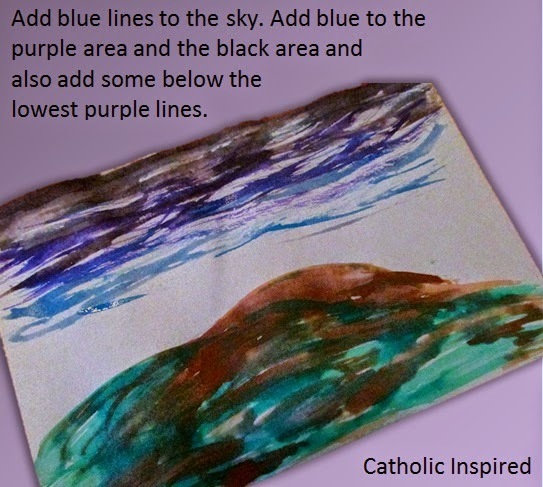 If you add water to the paper the colors will "bleed" further and easier, but the painting will be lighter. The paint will be lighter in color when it's dry. So the colors you see while it's wet will change when it's dry. 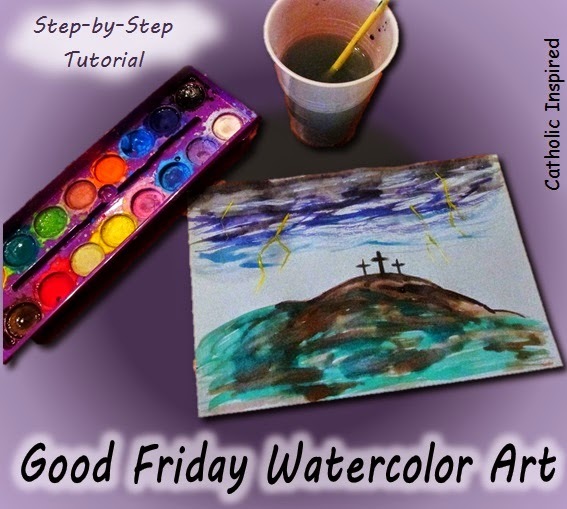 Add water to the colors you are going to use. Squish the brush into the paint to make the top layer soft and liquidy. Be sure to rinse your brush in a cup of water before you switch to a new color. 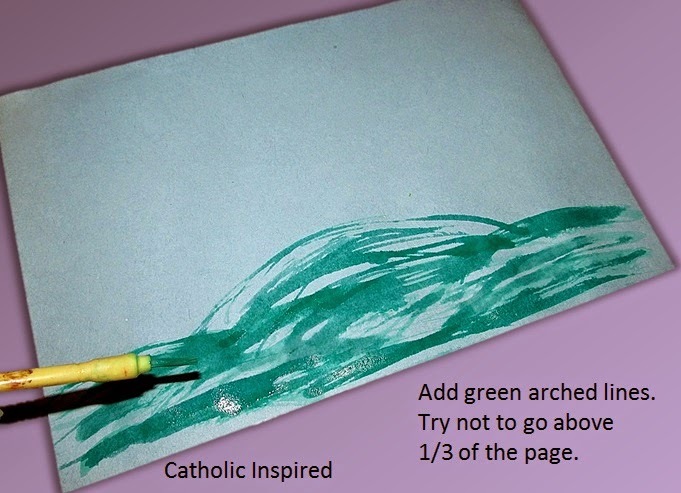 To make the hill, add green arched lines across the bottom of the paper. Try not to paint above 1/3 of the page so you have room for other things on your painting. Add brown paint in and around the green. You may need to add more green, too. 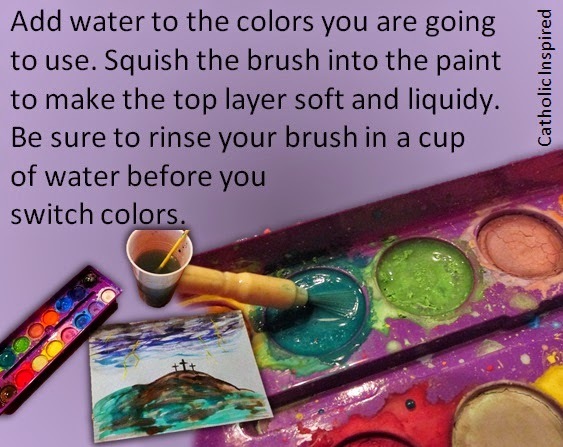 Use a brush-full of plain water to blend the two colors together. 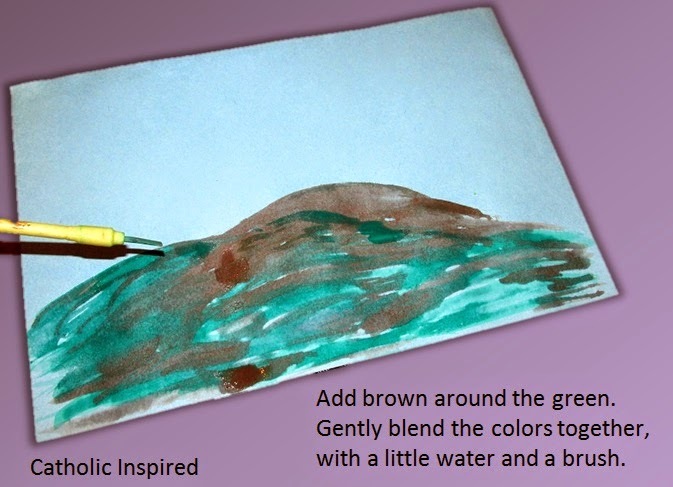 Add paint and blend with plain water till you are happy with your hill. Add black to the top of your page. Make the paint thick on the top and get thinner as you move toward the hill. Adding straight lines going across from side to side works best. Now add purple to the sky. 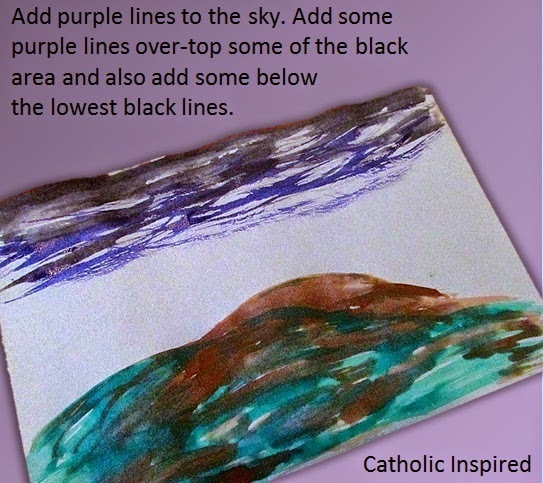 Be sure to add some purple to the black and also add some to the area below the lowest black line. Next, add blue. This should be added in the black area, the purple area, as well as, below the purple area. If you wish you can use more plain water on your brush to make the colors blend together. Now, add the crosses. Dark brown or black works best. 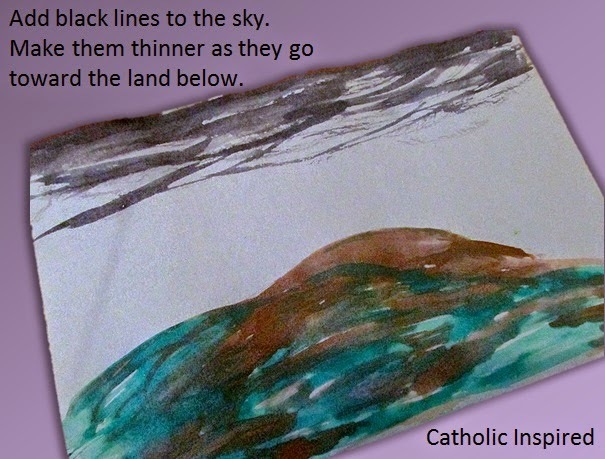 Be sure it's thick paint and has little water so you can make thin strokes. Practice on scrap paper first. 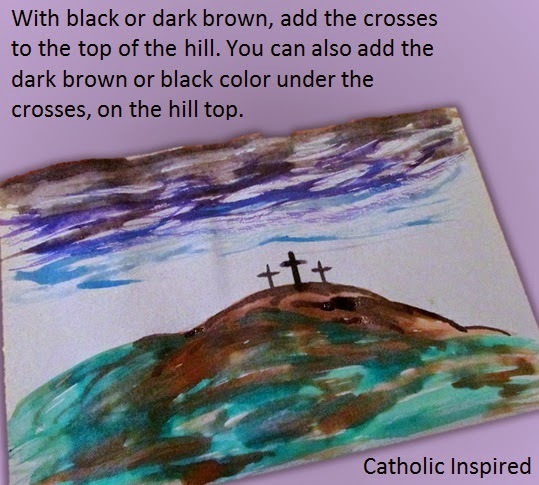 Add a dark brown or black edge to the hill, under the crosses. FOR YOUNGER KIDS: Young kids can use a marker after the painting is dry. You can add some lightning, with some thick yellow paint. Be sure to have only a little water in the yellow paint, so you can make thin strokes. Try it on scrap paper first. 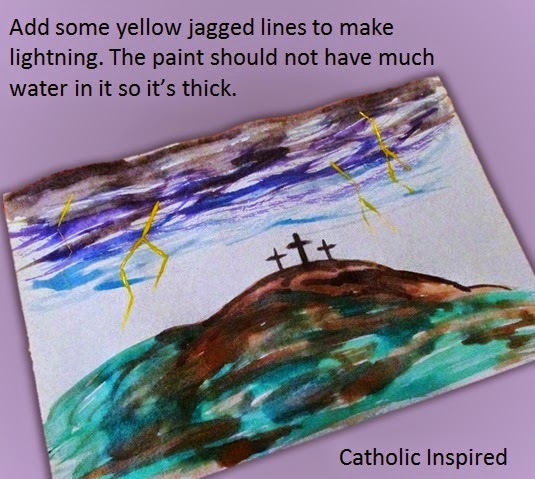 FOR YOUNG KIDS: Young kids can use marker to make the lightning, just be sure the painting is dry first. This is my daughter, Hannah, (age 8) painting her picture. Here are a few more pictures of the finished painting my kids made. They all have different designs and focuses! Each one has it's own unique beauty! This last one was done by my 5 year old, Naomi. 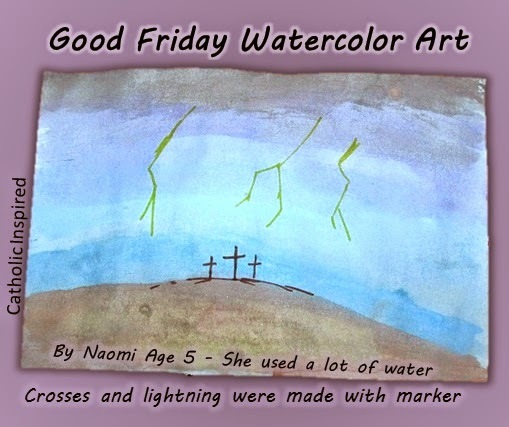 She used a lot of water so her painting is very soft looking. 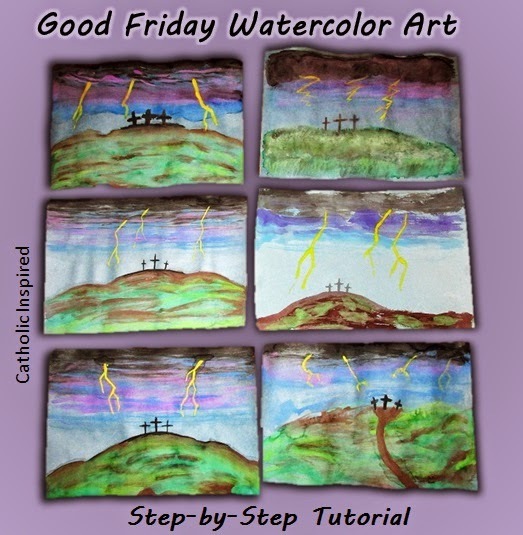 We used brown and yellow markers to make the crosses and lightning. Okay, I hope I explained that well enough! Have fun trying this, too! 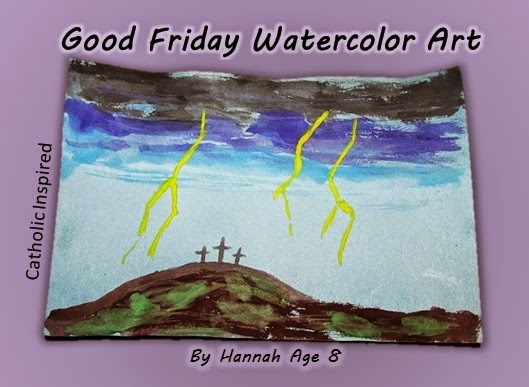 And remember this is a painting of Good Friday, so if the painting looks a little messy, it adds to the sad feeling of the painting. Please pray for me and I'll pray for you. Love, love, love! I will def be doing this with my kids! Didn't get a chance today though. I hope all is well, Jen...I wanted to tell you that I mentioned this craft in my weekly wrap of today. :) Thanks for sharing this fantastic tutorial! is there mail on good friday ?